As Christmas approaches, I thought we might again discuss Christianity in Tang China (618–907). In an earlier post (see here), we surveyed the basic history of this religion during the period in question, so I will direct readers to this earlier discussion if they are not already familiar with the topic. What I want to discuss in the current post is the references to the Star of Bethlehem and the Magi in Chinese sources from the Tang period. I believe these references can tell us something about how Christianity was first transmitted and what sort of direction it took over the course of its maturation in medieval China. The earliest reference to the Star of Bethlehem – and to Jesus himself – is found in the Xuting Mishi suo jing 序聽迷詩所經 (T 2142), i.e., the Jesus-Messiah Scripture. This curious text was apparently rediscovered in the twentieth-century and purchased in China by Takakusu Junjirō 高楠順次郎. Although its authenticity is not entirely accepted by all modern scholars, I tend to think the text itself is authentic based on its content and vocabulary. To give some background to the text, the so-called “Nestorian Stele” erected in 781 explains that in the year 635, a mission led by Aluoben 阿羅夲 from the country of Daqin 大秦 (a general term for the Levant) arrived in the Chinese capital Chang’an 長安. We also know that in 638, the “Persian monk” (波斯僧) Aluoben presented his scriptural teachings (經教) to the court as tribute. These new teachings were considered beneficial, and thus the court ordered the construction of a monastery in Chang’an, which marks the beginning of formal Christian activity in China. The Jesus-Messiah Scripture as it presently exists is not fully extant, although there is still ample content. This text describes the life of Jesus including the Virgin birth, his baptism by John, his miracles, arrest, crucifixion and resurrection, in addition to general Christian precepts for daily life. It also uses various foreign names and terms in Chinese apparently translated from Syriac (Jehovah 序娑, Messiah 彌師訶, Mary 末艶, Jesus 移鼠, Jerusalem 烏梨師𣫍, Jordan 述難, John 若昏, Pilatus 毘羅都思, Golgotha 訖句). The author of this text continually insists upon the virtue of filial piety, as well as including frequent respectful addresses to the Chinese Emperor, indicating a conscious adaptation to Chinese values. This Divinely Honored One [i.e., God] is in Heaven, universally presiding over Heaven and Earth. When Jesus the Messiah was born, being present in the world, there appeared brilliant fruits [signs?] in Heaven and Earth. A new star was recognized in the sky above. The star was great like a wagon-wheel. Again, the Chinese is awkward, but it is clear that this is referring to the Star of Bethlehem, mentioned in the Book of Matthew (2:1–12), which signaled the birth of the Messiah. Curiously, the text states Jesus was born “in the city of Jerusalem in the park [=country] of Rome 拂林園烏梨師𣫍城中.” Here 烏梨師𣫍 is clearly from Syriac Urishlim, i.e., Jerusalem (see here for pronunciation of the Syriac). The character yuan 園 (park) is a scribal error of guo 國 (country). Bethlehem is actually a separate settlement south of Jerusalem, so this is anomalous. Fu lin 拂林 here would have been pronounced at the time in Middle Chinese as pʰjuət ljəm (Schuessler IPA) or something approximating this, which is the name “Rome” borrowed from an Iranian language, such as Sogdian frwn and brwn, or Middle Persian hrōm. The Christian community was formally established in China in the 630s, but it was generally insignificant in terms of cultural and religious influence until the late-eighth century. Their community would have been mostly comprised of ethnically Iranian people as well as a few other foreigners who had traveled from the Near East. It is noteworthy that the first datable reference to the seven-day week in Chinese is also found in the text at hand: “On that day, they took the Messiah and tied him to wood [i.e., a cross] for five hours. This was on the sixth fasting day [Friday] 其日將彌師訶木上縛著五時是六日齋.” Nevertheless, the custom of the seven-day week was still unknown to most Chinese until the following century, when it was Buddhists who implemented its widespread use in East Asia. 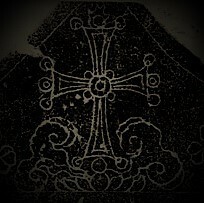 This point illustrates that the early Chinese Christian community was limited in its influence. The angel proclaimed good tidings. The Virgin gave birth to the Sage in Daqin [the Levant]. The luminous asterism indicated a portent. The Persian(s) witnessed the brilliance and came to pay tribute. There are two things I would like to note here. Magi bear gifts to an infant Jesus. First, in contrast to the stele that reads “Persian(s)” (Bosi 波斯), Matthew 2:1 in Greek reads μάγοι, i.e., Magi, which was translated in the King James Version (completed in 1611) as “wise men” (see here). The Peshitta, the standard version of the Bible in Syriac, gives “Magoshi” (see English translation at available at http://www.peshitta.org/). The Magi, of course, hail from Persia, so the stele’s choice of vocabulary is not entirely erroneous, although it is curious. I suspect the author of the inscription, the famous translator Adam 景淨, decided to use a term which would have been immediately recognizable to Chinese readers, rather than using a transliteration of Magoshi or some other functional equivalent from the Buddhist or Daoist lexicons (Fashi 法師 “Dharma Master” or Daoshi 道士 “Daoist Lord” might have worked well in capturing the idea of a figure adept in rituals and religious lore). The problem here, however, is that the term they used has no such religious or occult sense to it. In fact, Bosi 波斯 in this period had a significantly different connotation: Persians were stereotyped as wealthy merchants. 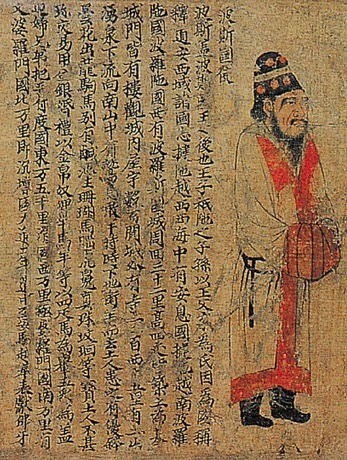 The author Li Shangyin 李商隱 (813–858) gives a list of things that are considered “unsuitable” or “unreasonable” (meant to be humorous), the first of which is a “poor Persian” (窮波斯). He also mentions “an ill physician” (病醫人) and “a teacher illiterate and a butcher reciting sūtras” (先生不識字屠家念經). The idea here is that such things ought not to happen, so it would be amusing if they did. The stereotype about Persians being wealthy no doubt reflects their status as merchants in Tang Chinese society. The point to take away here is that Adam’s choice of word to describe the Magi was, in reality, a bit off. What does this indicate? It seems to suggest that Adam simply understood the Magi as Persians who came to offer tribute to the Messiah when he was born. Although this might be reading too much into the text on my part, there is another part of the cited passage from the stele that caught my attention. The word in Biblical Greek for “star” in Matthew 2:2 is ἀστήρ (astér), which simply means “star” (see here). The corresponding Chinese term, which I translate as “luminous asterism” is jing xiu 景宿. The latter character in any astronomical context normally refers to the twenty-eight Chinese lunar stations (i.e., constellations through which the Moon transits) or, especially in the Buddhist context, the twenty-seven or twenty-eight nakṣatras, which are also constellations through which the Moon transits over the course of its monthly circuit (in China the indigenous model was used as a functional equivalent when translating the Indian terms). In the year 781 when the stele was erected, Adam should have presumably understood that this character does not refer to a star in the singular. Although this variance might merely have been a stylistic decision, I have to wonder if there is more to this than just that. It is quite likely that the Chinese Christian community in the later part of the Tang dynasty had become quite Sinicized. As the available evidence indicates, it does not appear that their community translated the Bible in its entirety into Chinese. Although we can probably safely guess that the clergy possessed the Bible in Syriac, we might speculate that their clerics originally born in China were not necessarily fully literate in Syriac. We can draw a parallel here with the Buddhist tradition and their approach to Sanskrit. China in the eighth and ninth centuries had tens if not hundreds of thousands of Buddhist monks, but very few of them could read and comprehend Sanskrit. Japan preserves many Sanskrit documents written in siddhaṃ script that were brought over from Tang China. These are often accompanied by transliterations of the siddhaṃ lines into Chinese characters, which shows that on the mainland some Buddhist monks were, in fact, reading out loud Sanskrit texts. The question remains, however, how much did they actually comprehend without reference to existing Chinese translations? 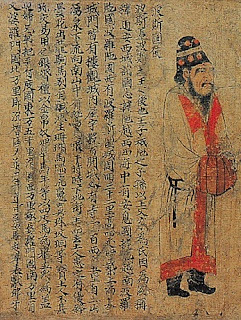 East Asian Buddhism as a whole, despite the achievements of monks such as Xuanzang and Yijing who became fully literate in Sanskrit, never developed traditions of Sanskrit scholarship, and instead relied almost exclusively on Chinese translations. Did something similar occur with the Chinese Christian community? Although Adam was famous for his translations of Christian literature into Chinese, how many of the native-born clerics – even those of Sogdian backgrounds – were literate in Syriac? It is unfortunate that only a handful of documents survive from Tang Christianity, otherwise we might be able to say more about this community. Hopefully in the future more documents from the Christian tradition will be rediscovered in China. Professor Kotyk, I have a question. Do you know of any good books or research papers a layman could read that deal with the differences in Buddhology between Vajrayana and Mahayana? What I mainly find confusing is that in the Mahayana one takes rebirth as the classic Shakyamuni style itinerant teacher in a world devoid of Buddhism and preaches a historically unknown doctrine, while in the Vajrayana, they say Buddhahood could be achieved in one lifetime, therefore they must have claimed that some of their practitioners were Buddhas? But these Vajrayana Buddhas in this world, they weren't Shakyamuni style original teachers in a world devoid of Buddhadharma, so therefore Vajrayana must have a different conceptual definition of what a Buddha is, a more broad definition. So is there any one single work which discusses this point? To bring it down to the personal level, I'm starting to find the singular Mahayanist "come back and be a Buddha" end-goal to be a little staid. Combine that with the fact that I am starting to notice that you can truly help a lot more people by blending in more and being less categorically fussy about your conduct, and I'm starting to wonder if I should switch vehicles after this time? I feel like I have already switched vehicles in attitude, if not formally. Currently still running with Dharma Drum though, I have a soft spot for them. That's a very good question, Merle! I'm tempted to suggest Kukai. See Kukai: Major Works by Hakeda. Kukai dealt with the differences between Mahayana schools and what he called Mikkyo. I think his work might give you some useful insights. There's also Lama Tsong Khapa's Lam Rim, which is fully translated. If I recall correctly, I believe he touches on matters related to your question here. However, I know for sure Kukai's writings (translated by Hakeda) address this matter.